Wow… what a learning experience. That’s about the best I can say about this run. Let’s get the details out of the way first, and then I’ll explain a bit further. 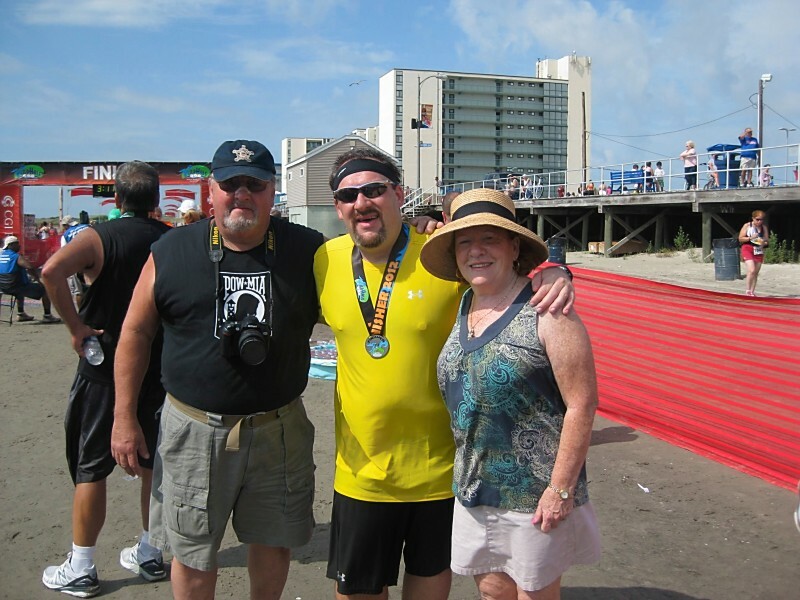 There was a real nice group turn out for this run… Jennifer came down with me and ran the 8K, Nancy & Martin were there as well, while my best friend Joe ran his FIRST EVER half-marathon, along with Nancy’s cousin Ann Marie! Nice turnout for the race and, after some skepticism regarding the weather (We woke up to thunder & lightning at 5a to start getting ready for race), it turned out to be a nice, sunny… hot… and humid… day. Hot and humid. This is not a formula for success for me, as past runs have dictated. Regardless, I’m positive I’m going to knock several minutes off my time from my first half marathon and spend the rest of the day relaxing and basking in my success. Also, this is my first half in my Five Fingers – as well as the longest distance I’ve ever run in barefoot shoes – and I’m actually REALLY excited about it! Race starts, and we’re all cruising together for about a half mile… Nancy & Ann Marie separate from Joe and I, while Martin is slightly behind us. We’re apart, but together, for the first few miles. The pace is fast for me… Joe’s in much better shape than I, but I keep up with him and Ann Marie for over 5.5 miles. Nancy and Martin are behind us, but not by too much. 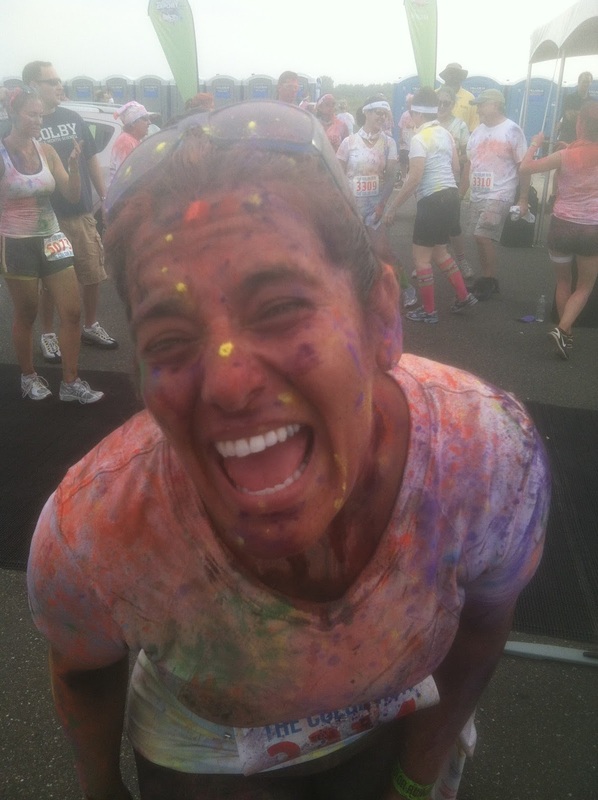 Mistake #1 – I am my own runner… I can not run at the same pace others can, only my own. We decide to walk for a bit, and when we restart I immediately can not keep up with him. I send him away and Ann Marie and I are running together deciding if we should wait for Team Mancy or not. Ann Marie decides to push her pace a little, and I wait for the dynamic duo because, at this point, I can barely run. Turns out Nancy and I are kinda in the same boat… she needed a breather just as much as I did so, with Martin kicking back up his pace, Nancy and I walk for a bit and try to remind ourselves that we actually LIKE doing this and need to keep going! Now, for the first time EVER running (regardless of length), I feel what I think was ‘cramping’. I could feel my calves start to tighten up a little… but this is where it gets weird – when I would stop to stretch them out, I could feel them actually start to tighten up! I could feel it climb up my calf. I stopped stretching, it slid down. I have NO idea what caused this… but it def made me keep my feet closer to the ground and not run on the balls of my feet. Few miles later Martin is waiting for us, and the 3 of us run… wait, let me rephrase… the 3 of us stay together because Nancy and Martin wait with me because, at this point, I literally cant stay hydrated. I’m soaked head to toe clothing-wise, but dry as as bone physically. I’m walk/ running at this point, not sure I’m even going to finish. My feet are barely coming up off the ground and, when I ‘run’ it’s at most a half-mile before I need to stop. Mistake #2 – I need to get a lot more educated on my hydration issues… I’m drying up WAY too quickly and it could lead to serious issues. There’s Jennifer… 8K medal around her neck, ready to get her jog on w/ me and help me get these last few miles. I’m way back in the pack so there’s not a lot of people around me, so Jennifer starts to run w/ me a little and what do I see? All alone, on the other side of the road, are my Mom and Dad… Mom cheering like I’m gonna win Olympic Gold, and Dad snapping photos left and right. Between Jennifer, Mom and Dad I finally knew I was gonna finish. Took almost 12 miles for me to realize it, but this was the moment I knew. Mistake #3 – Races of this length are as much mental as they are physical… my negative thoughts made this MUCH more difficult than it probably should have been. So… 3 hours and 3 minutes later, I was done. 10 minutes slower than my first one. My legs were literally shaking when I finally sat down. I couldn’t speak. I was a HOT MESS. This was a tough one for me. I need to take a step back and really figure out some things about me, how I run, how my body reacts to running, how I can mentally prepare better, etc. I like what I’m doing, but I don’t like how I felt after that. It was scary… uneasy… humbling. For the first time since I started this quest I feel like I have a limit… at least for the short-term. Gotta change some things for sure – and when I do y’all will be the first to know! 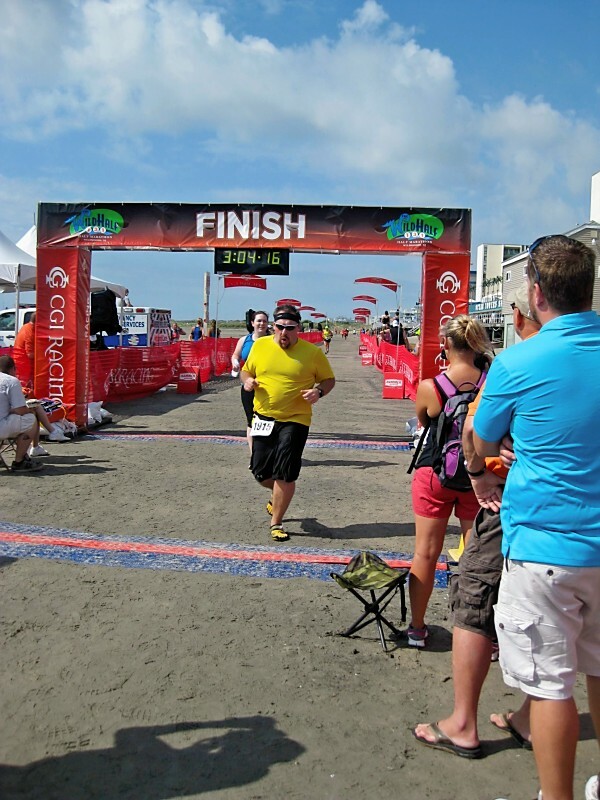 As for the good – I finished my 2nd half-marathon of 2012… that’s pretty freakin’ amazing. I also did my 1st half-marathon in Five Fingers – no small feat whatsoever. Perspective, people. Perspective. 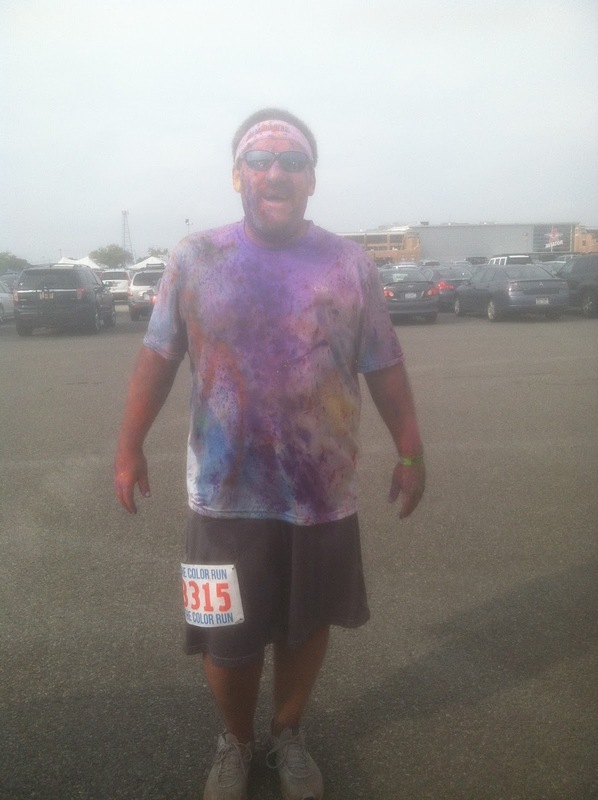 It’s amazing to think that 10 months ago I was 350 pounds and now I’m complaining about my time in my 2nd half-marathon. 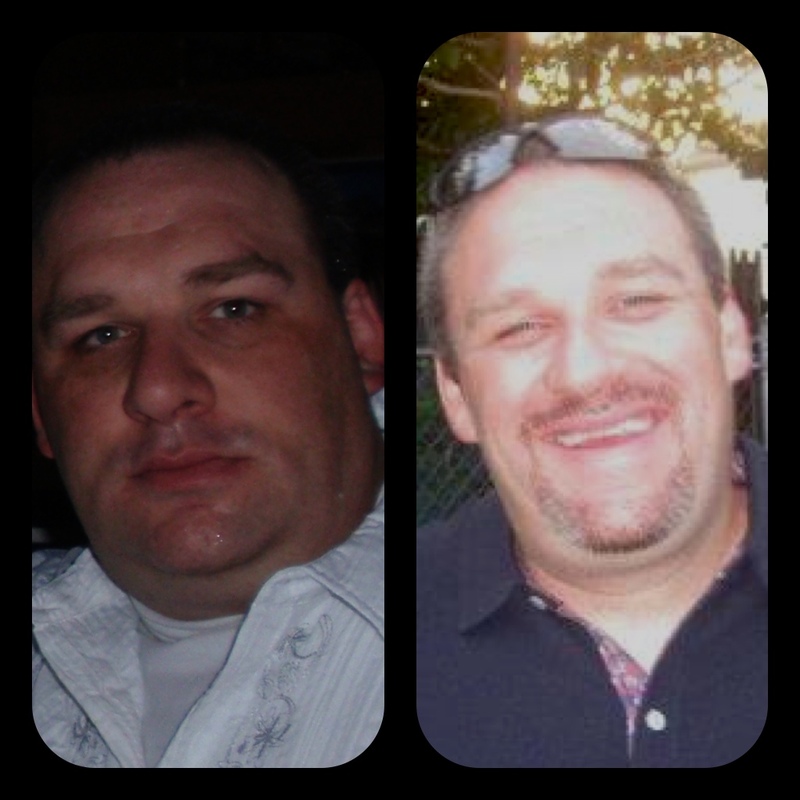 You guys know the one I’m talking about – it seems like everyone that loses any amount of weight puts it up: the heavy pic on the left, and the not-so-heavy pic on the right… maybe throw a few motivational words on it for effect. Well, now that I’ve lost over 90 pounds I get asked about seeing the difference more and more… people genuinely want to see the transformation from 346 to 256 and know that they too can make the changes that need to be made. On the left? That’s me a few years ago. Not happy, maybe even a little buzzed, out with some friends. On the right? That’s me about 2 months ago. Happy, maybe even a little buzzed, out with some friends. THIS is the transformation that needs to be celebrated. The fact is that true happiness is the REAL transformation which MUST… let me repeat, MUST… happen in order to succeed at ANYTHING you are trying to do. BEING HAPPY IS WHAT HAS ALLOWED ME TO ACCOMPLISH THESE GOALS. I’m living proof of this too, by the way… I’m not just pulling this outta thin air. I lost 50 pounds in 2010, but mentally was still miserable, and eventually all that weight came back – and then some. That happened because unless you’re mentally prepared to make these changes, none of it is gonna stick. So why NOW has it been a success thus far? Because mentally I’m in a great place, with a great supporting cast around me. I’m surrounded by family, friends and a girlfriend that not only support what I’m trying to do, but also practice what they preach… they live the kind of lifestyle that makes me be the best I can be. I SURROUNDED MYSELF WITH PEOPLE THAT SUPPORT THE LIFESTYLE I WANT TO LIVE. Because let’s be honest – the reality is that you probably can’t live drug-free if you spend your entire life hanging out with drug addicts… can’t quit smoking if everyone you’re around smokes all the time… can’t eat healthy if all everyone you know does is eat bad food at bad times in large quantities. Yes, Team Literal… there are exceptions to every rule. You can do it? Good for you… you’re the best – and in the minority. And probably lying, but I digress. 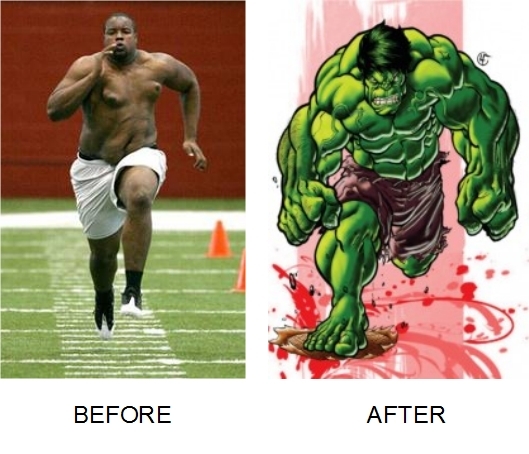 So… will you ever see an actual weight-loss ‘before/ after’ picture of me? Maybe… I don’t know. I actually have one I made a few months back that I almost posted. But, after talking to a few people I trust, they reminded me that it’s NEVER been about that for me. I realized then that the only reason I made that photo was I was feeling down… bad about myself… and wanted a way to make myself feel better. And all that did was prove to me even more that it was something I DIDN’T want to do. Hopefully I can continue to motivate you by being honest about my journey and the message I’ve tried to deliver – that there’s a lot more to being healthy that just losing a lot of weight – and that it’s just as much mental as it is physical. 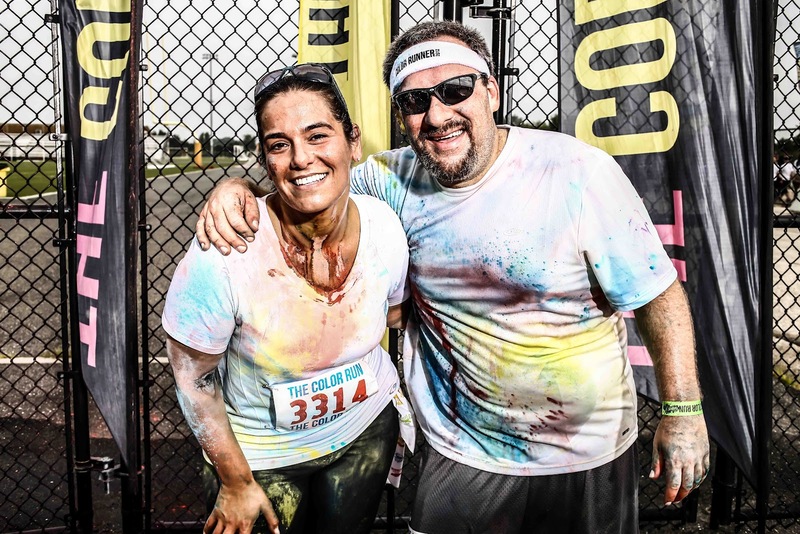 OK, let me explain what The Color Run actually IS in case you are unaware – it’s a 5K where, every ‘K’ they throw color at you, and each ‘K’ it’s a different color. They request that you wear as much white as possible to get the full effect of the color cornucopia you’re about to run though. Then, at the end, they have a party – with even more colors. Click HERE if you wanna get into more specifics! 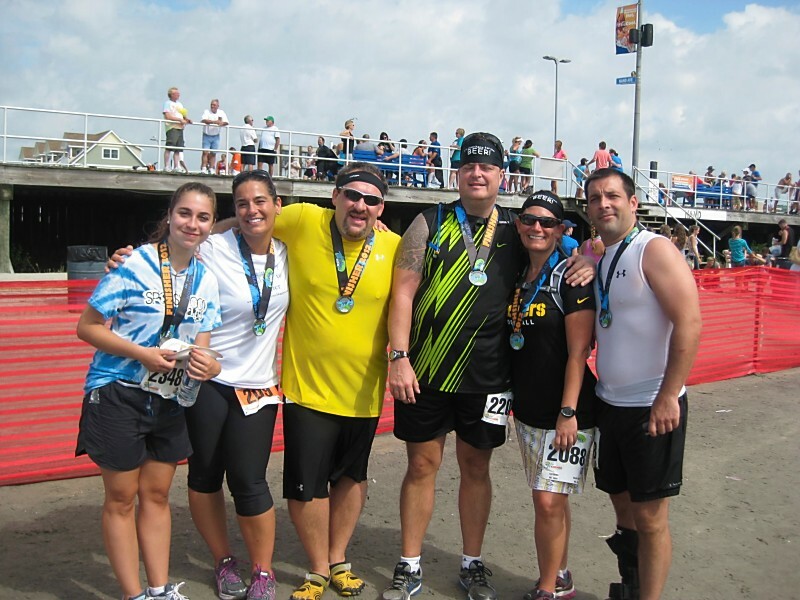 So… although it’s a 5K in length, it’s not actually a 5K race. I actually found out about it not being a race 3 days before, when they sent the final information e-mail… that was when I read that they didn’t keep time. When I saw that, I admit I was disappointed. I mean, you race to get a time, right? Right?!?! 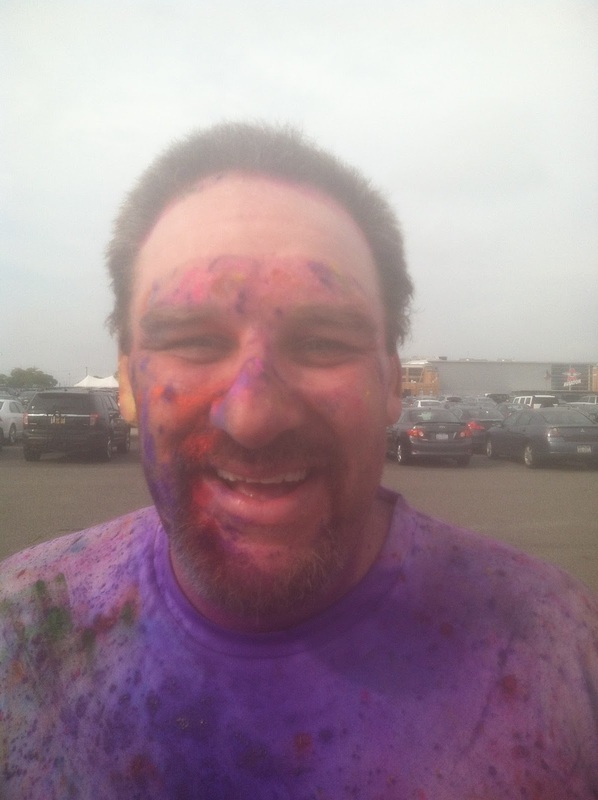 How will my next big accomplishment – completing The Color Run – show up on my Athlinks page is they DON’T KEEP TIME!?!?!?! THAT’S A QUOTE, PEOPLE. I put olive oil in my salad, now I gotta put it in my hair?!?! What in the HELL did I get myself into?!?! So yeah, they tell you to put olive oil in your hair so the color doesn’t stay – because honestly who wants to go to work with multi-colored hair? Jen and I also had to prepare other items, such a garbage bags for ourselves (and our post race clothing) and our car (to cover the seats, etc. ), baby wipes, paper AND cloth towels and, of course, a camera. 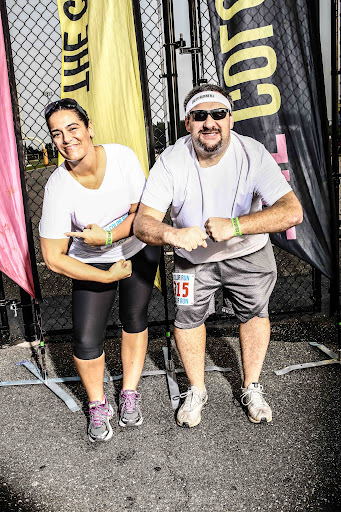 We get there, get signed in and then make sure we are as close to the front of the start as possible… since I was running a half marathon and she was running an 8K the next day. 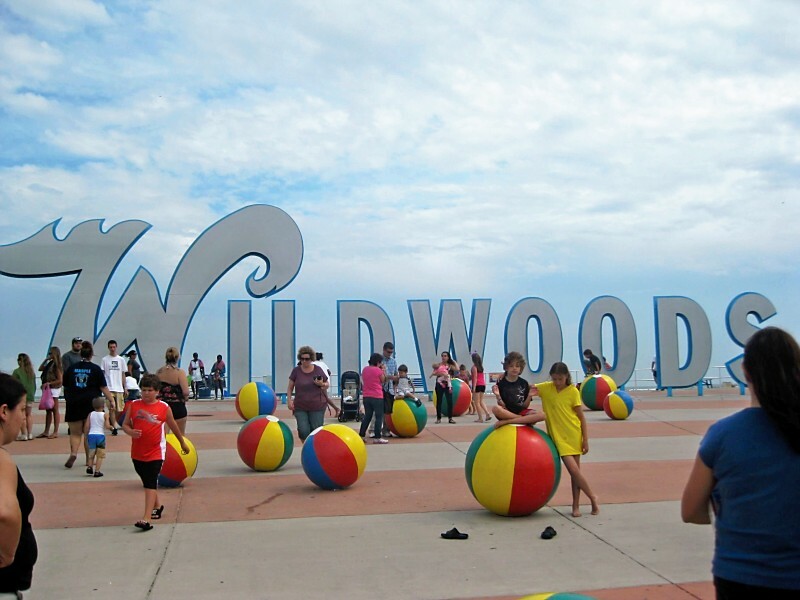 In Wildwood, NJ. 4 hours away from Brooklyn. Yeah… But we’ll cross that bridge when we get to it. For now, it’s all about The Color. 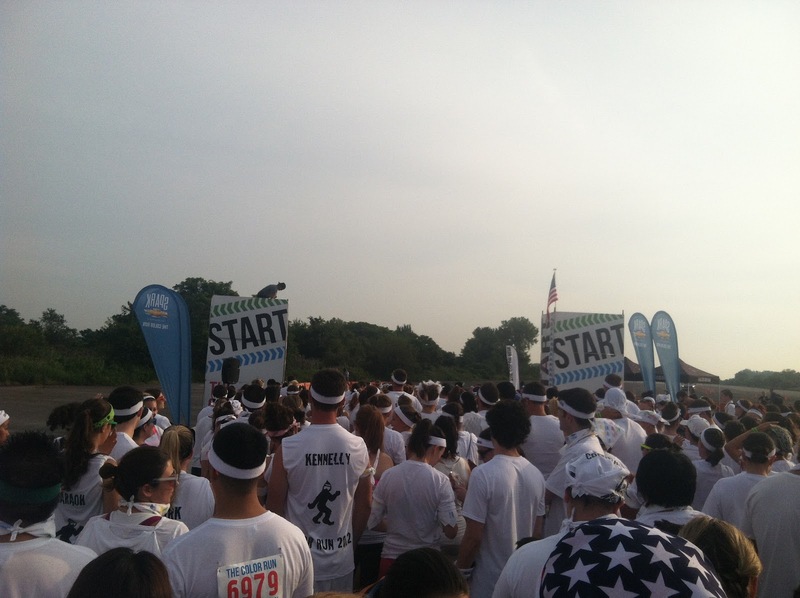 We’re lined up and probably among the first 100 people to start the race. The emcee is gettin’ everyone fired up, throwin’ out extra color packets, shirts, headbands, etc… even bringing up some German guy who was REAL excited to be there running it. The run starts and we’re off… and as I picked up my head I realized it looked like a scene from The Walking Dead – an abandoned airfield, bushes on either side of it, cracks all over the airstrip and 1,000 people running at various speeds all over the place, yet headed in one direction. Since the area is so wide open, you could see the color locations fairly easily, and you were instructed to run closer to the people if you wanted more color, farther away if you wanted less. Well, as you can imagine, Jen and I decided to run REALLY close to them. Not bad! 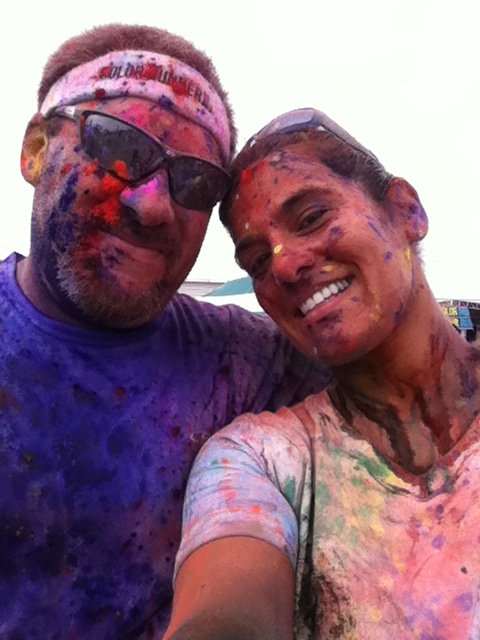 Got a little color, had a little run… nice time. But now comes the after-party. The after-party seriously reminded me of the Limelight in NYC circa 1993… without the overpriced drinks, cage dancers & recreational drugs (that I NEVER HAD). 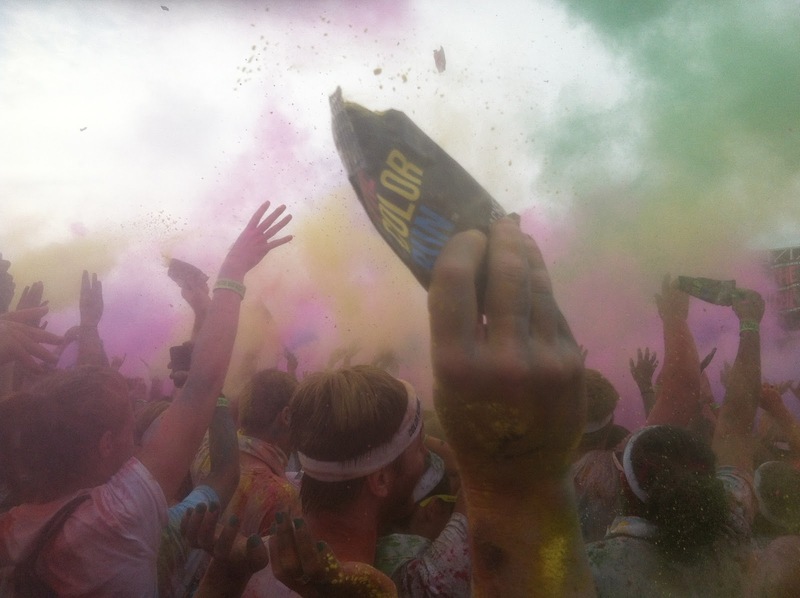 Everyone was huddled around the stage and the DJ prompted the runners to pull out their personal color packets – because in 90 seconds we were all releasing them at the same time. Yeah… THAT was the after-math. I wanna close this blog with how I started this – EVERYONE IN THE WORLD NEEDS TO DO THIS RUN. 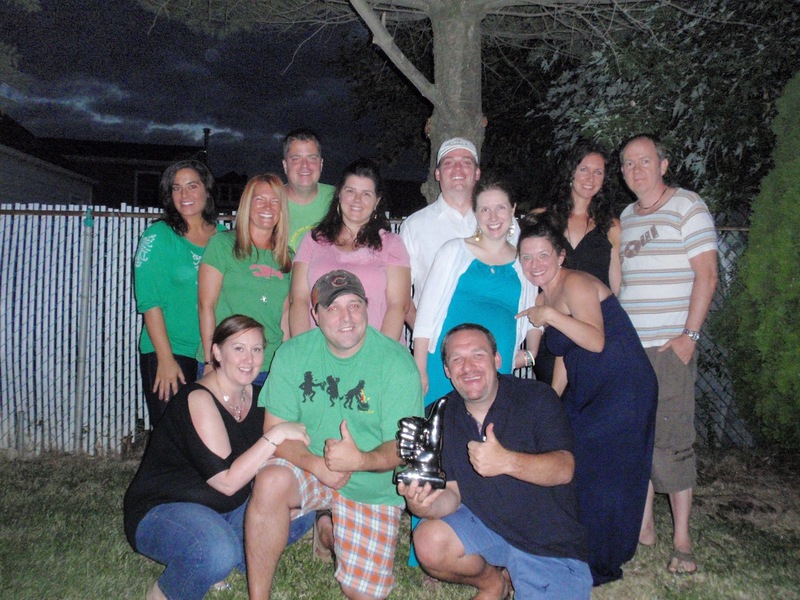 It’s way too much fun not to get a huge group of people together to do… and to that end I’m already plotting for Team Blubber To Runner to represent at The Color Run 2K13. I’ve got some time for that… but for now – we gotta shower this stuff out of our hair. 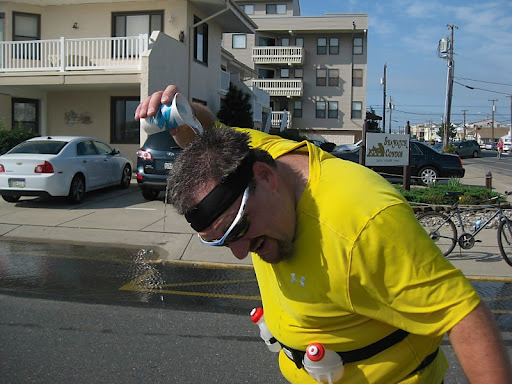 You are currently browsing the Blubber To Runner blog archives for September, 2012.